Thanks for the review! I, too, am excited for this release, and have only heard wonderful things about it. It is totally among the books I need to write within the next couple of months!! It sounds amazing and original and like you say hopeful and poetic I am sure!! I love dystopian novels.. It gives you a grim sense of the future but you can learn a lot from it too! Great review! This is one of my most wanted books for 2010. I’m itching to read it. 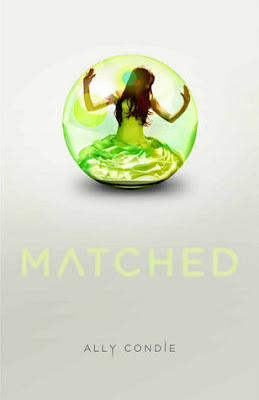 I lovelovelove sci-fi, so I’m really happy with these YA sci-fi books that are coming <3 Matched sounds great! I’m absolutely DYING to read this book! Can’t wait! I cant wait to read Matched! The cover is perfect and the plot sounds AMAZING! Im sure I’ll freak out before its release date. I have to say: I really loved your review! Really love the review of the book, can’t wait for the book to come out… absolutely will have to add this one to my list of books have to get… I am always looking for stories that have something with love and having to choose what you want from life! Thank you for the review, look forward to more good ones! Good review. I’ve been wanting Matched forever, and your review only makes me want it more. Thanks for the great review. This has been on my to-read list since I first heard about it and I love the cover. Great review! Can’t wait for the book to come out and I completely agree with you, the cover is magical and perfect! Whoa, what a review! I’m dying to read this book already. I love to read stories which talk about a possible tussle between real path of passion and the usual “perfect” path that everyone follows. Can’t wait for the book to come out.